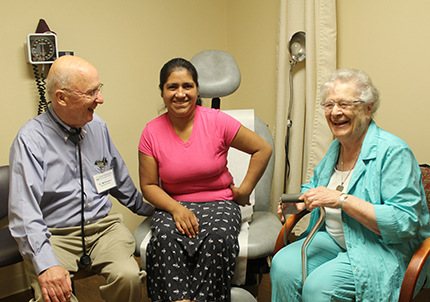 As one of her many volunteer activities, Sister of Charity Mary Barbara Philippart serves as interpreter at the Good Samaritan Free Health Center in Price Hill (Cincinnati, Ohio). In 2011, S. Mary Barbara moved to the Motherhouse in Mount St. Joseph, Ohio, but during her years in full-time ministry, she spent 26 years abroad in Peru. There, she ministered for six years with other Sisters in Lima at a tri-lingual school for the Chinese colonists. Then, she headed into the Andes Mountains for 20 years, where she served in a local parish evangelizing, implementing community organization and development, and acting as social worker. Her years in Peru rendered her very fluent in Spanish, so when she returned to the United States, she fully intended to maintain contact with the Hispanic community. Currently, S. Mary Barbara continues to utilize her Spanish skills and says, “There is a great need for interpretation.” Outside the Motherhouse, she regularly serves at the Good Samaritan Free Health Center on Monday mornings, and during its operating season, she accompanies S. Montiel Rosenthal to Belterra Park (horseracing track) on Thursday evenings to attend to the poor who work there. On a less regular basis, she visits the St. Vincent de Paul Charitable Pharmacy and the Health Resource Center to serve as an interpreter whenever she is needed. The second program brings free lunches to 15 elderly and 15 high school students for 10 months each year. The program is run by the local Women’s Club, and the parents of the recipient children work eight days for the local parish each year. Not only does S. Mary Barbara tend to the larger community, but she also maintains a presence within the smaller SC community. She greets guests and answers the phone at the Motherhouse main entrance desk twice each week for short intervals, and participates in the vigil ministry, during which she accompanies dying Sisters. “It’s one of the most beautiful, awesome ministries I’ve had,” she says. For S. Mary Barbara, it is inspiring to be with Sisters who are going to God because they are so at peace. Though she is almost 90, Sister continues to remain active in her ministries, and she enjoys every minute. “I like meeting people,” she says, and throughout all her ministries, she finds her relationship with God strengthened, as well as her connection with the Sisters of Charity mission. And it keeps her in contact with the Hispanic community, with whom she feels at home. Plus, she says, her ministries allow her to get out and bring people closer to God through prayer.